Alfred A. Knopf, 9780307379382, 273pp. From one of the most innovative and vital writers of his generation, an extraordinary collection of stories that showcases his gifts—and his range—as never before. In the hilarious, lacerating “I Can Say Many Nice Things,” a washed-up writer toying with infidelity leads a creative writing workshop on board a cruise ship. In the dystopian “Rollingwood,” a divorced father struggles to take care of his ill infant, as his ex-wife and colleagues try to render him irrelevant. In “Watching Mysteries with My Mother,” a son meditates on his mother’s mortality, hoping to stave off her death for as long as he sits by her side. And in the title story, told in a single breathtaking sentence, we watch as the narrator’s marriage and his sanity unravel, drawing him to the brink of suicide. As the collection progresses, we move from more traditional narratives into the experimental work that has made Ben Marcus a groundbreaking master of the short form. In these otherworldly landscapes, characters resort to extreme survival strategies to navigate the terrors of adulthood, one opting to live in a lightless cave and another methodically setting out to recover total childhood innocence; an automaton discovers love and has to reinvent language to accommodate it; filial loyalty is seen as a dangerous weakness that must be drilled away; and the distance from a cubicle to the office coffee cart is refigured as an existential wasteland, requiring heroic effort. In these piercing, brilliantly observed investigations into human vulnerability and failure, it is often the most absurd and alien predicaments that capture the deepest truths. 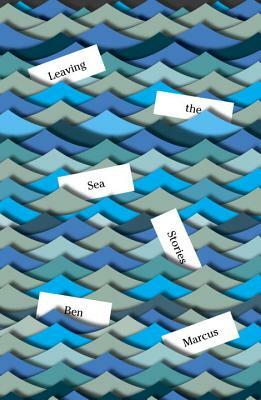 Surreal and tender, terrifying and life-affirming, Leaving the Sea is the work of an utterly unique writer at the height of his powers. Ben Marcus is the author of three books of fiction: "The Age of Wire and String, Notable American Women, "and "The Flame Alphabet, "and he is the editor of "The Anchor Book of New American Short Stories." His stories have appeared in "Harper's, The New Yorker, Granta, Electric Literature, The Paris Review, McSweeney's, Tin House, "and "Conjunctions." He has received the Berlin Prize, a Guggenheim Fellowship, a Whiting Writers' Award, a National Endowment for the Arts Fellowship in fiction, three Pushcart Prizes, and the Morton Dauwen Zabel Award from the American Academy of Arts and Letters. He lives in New York with his wife and children.